There is a global shortage of 7.2 million health workers worldwide – and this is set to rise to 12.9 million by 2035. Community Health Workers (CHWs) are a sustainable and effective way to fill this gap and extend health services to remote communities in developing countries. CHWs can play a vital role in diagnosing and treating the most common infectious diseases and childhood illnesses, provide care for pregnant women and newborn babies, and educate communities about preventive health measures. They can also refer patients on to hospitals when more critical care is needed. Malaria Consortium has been working across Africa to expand and improve community health programmes to bring healthcare closer to communities that need it most. Our projects work to find innovative ways to build on community health solutions, including through mobile phone technology and participatory community dialogues. 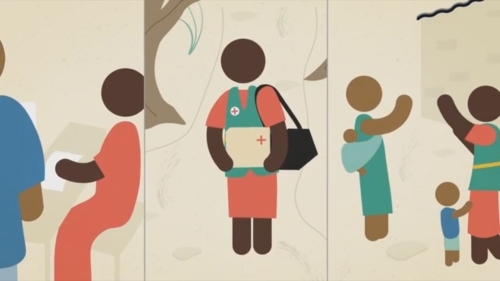 Watch our animation to see how CHWs like Laurinda are improving healthcare in their communities, what she needs to help her do her job, and the role of policy makers in filling the global healthcare shortage.